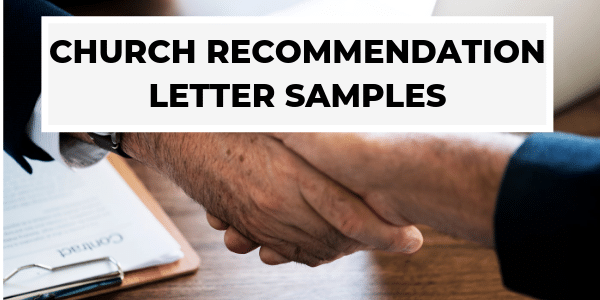 These Church Recommendation Letters are a great way for Pastors to get started with the task of providing written recommendation letters for church members and adherents. Whether it’s a letter to recommend a person to membership at another church or a recommendation letter for a job, or even a letter of recommendation for an adoption, you are sure to find letters you can easily modify and use! On behalf of the Church Board at First Christian Church, I am writing this Church Letter of Recommendation for (Mr. Church Member) to recommend that you receive him into Membership at your church. Logged in Members, CLICK HERE to view and/or copy full text! Again, I want to extend my warmest thanks for the privilege of ministering at your church on _________. We thoroughly enjoyed out time with you and you congregation, and trust that God will continue to lead you, and grant you His wisdom and strength as you lead them to greater heights. Logged in Members, CLICK HERE to view and/or copy full text! This letter is to wholeheartedly recommend the ministry of Evangelist David Smith to you and your congregation. His ministry here at First Christian Church was a tremendous blessing to our people as he shared the Word of God with conviction and boldness, yet with a spirit of humility. Logged in Members, CLICK HERE to view and/or copy full text! On behalf of the Church Board at First Christian Church, as well as the request of Mr. Church Member, I am writing to request a letter of recommendation and transfer of Membership from Second Christian Church to First Christian Church. Logged in Members, CLICK HERE to view and/or copy full text! Note: The letter below is only an “example”. You will need to be extra careful in using this as you need to be sure that the letter is a correct reflection of the person you are recommnding. Of course, you can always edit the letter as needed. This letter is coming to you in response to a request to provide a letter of recommendation of one of our members (or adherents) by the name of “John Smith”. Logged in Members, CLICK HERE to view and/or copy full text! I urge you to consider the Word and music ministry of “Guest Ministry”, consisting of John and Jane Smith to come and minister to your church. They will bring to your ministry platform, an excellent presentation of gospel, along with dynamic music/song to edify and equip the body. Logged in Members, CLICK HERE to view and/or copy full text! Note on this Recommendation letter: While it is difficult to write a “sample” personal letter such as this due to the uniqueness of each individual, these are some elements that are important to write a letter of recommendation if you are comfortable doing so. One should state the facts as known without being too patronizing. I am writing this letter at the request of _______ _______ who is presently seeking employment at your company. Logged in Members, CLICK HERE to view and/or copy full text!